The southeastern Brazilian state of Espirito Santo has been plagued by violence since police went on strike there. Reports of dozens of murders, looting and arson forced authorities to shut down malls and dispatch troops to the state. Since Friday, family members of the police officers have been staging protests in front of eleven police battalions in more than 30 cities, “barricading” the exits and preventing officers from performing their duties. Family members, among them many women and children, are demanding an increase in pay and better working conditions for the officers, who are prohibited by the constitution from embarking on a strike themselves. The lack of police on the streets has resulted in a criminal rampage, with 62 people being killed according to the Union of Civilian Police in Espirito Santo. With a rapidly deteriorating situation, local authorities requested help from the federal government. 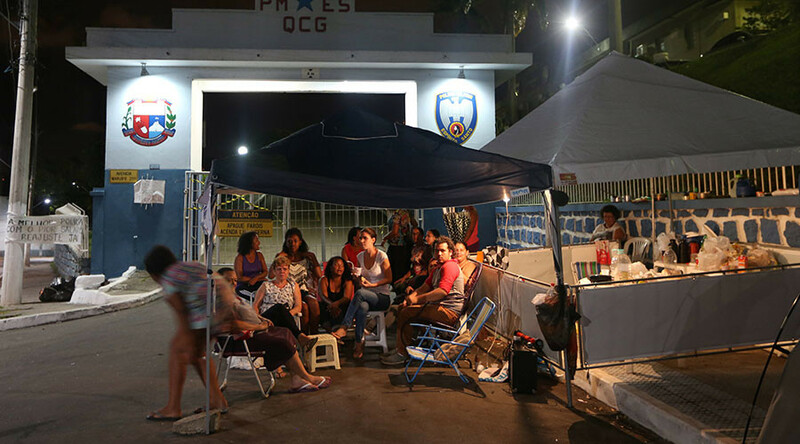 On Monday, Brazilian President Michel Temer authorized the deployment of 200 National Force members to Espirito Santo which have since been patrolling the streets. According to the Union, the number of deaths jumped 1,000 percent compared to January, when only four deaths were recorded for the entire month. The scope of crime has significantly surpassed the capacity of the morgue in the state’s capital city, Vitoria, with 16 bodies lying on the floor, Folha de S. Paulo reported on Monday. There has also been a sharp spike in looting. At least six malls were closed for fears they could be plundered. At least two buses were set alight, and many drivers preferred to stay indoors like other residents. “The biggest problem is uncertainty, we do not know how long it will last, even to pay bills is tricky as the Banks are closing,” Leonardo Regiani, a local dentist told Folha de S.Paulo, adding that out of eight out of twelve patients had canceled their appointments. — iranildo lopes (@iranlopes_) 7 февраля 2017 г. The authorities have decided to suspend school services, shut municipal parks, and all public health facilities in Vitoria as a result of the industrial action, UOL reported. If the officers do not comply with the ruling, the police associations to which they belong will have to pay a fine of R$ 100,000 (US $32, 080). This ruling has been disputed by members of the associations, who claim the strike action was organized and led solely by women. However, on Monday, only a few policemen complied with the order and left the barracks to work on foot, the Globo reports. Defense minister Raul Jungmann, who arrived in Vitoria on Monday said, “the military is already on the streets, and between now and tomorrow we will have an effective force compatible with the state's needs".